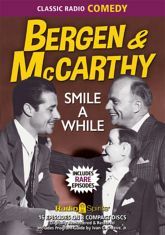 You can't join the army when you're three feet tall and made of wood -- but honorary Sergeant Charlie McCarthy found a way to help the war effort by entertaining on the home front! Here are some of Charlie's funniest wartime escapades from 1943 -- many of which have never before been available! Oh, and Edgar Bergen's around, too -- that guy who somehow makes us believe that Charlie, Mortimer, and Effie are real. Regulars Don Ameche, Dale Evans, and Ray Noble are on hand, along with guest stars Roy Rogers, Carmen Miranda, Sydney Greenstreet, Lena Horne, William Bendix, and many more!